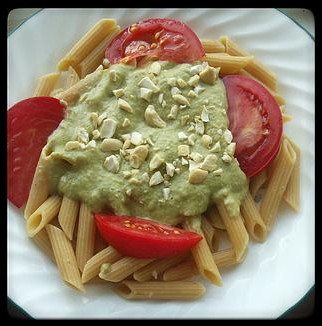 Creamy Basil Sauce - Vegans Eat What? Vegans Eat What? This Sauce is very versatile. It is fabulous over all types of pasta and can also be used over rice, like Black (Forbidden) Rice. In a blender process the raw cashews until the mixture resembles very fine, powdery crumbs. Take a knife and scrape the sides so all the crumbs are in the middle. Add the nutritional yeast, whole wheat flour and salt but don’t blend yet – you will use this in a bit. In a medium saucepan over medium-high heat, cook the onions and garlic ½ cup of water (or as much as needed) until the onion is soft and fragrant, about 6 minutes. Add the basil and cook, stirring frequently until it is wilted and bright green, about 2 more minutes. Reduce the heat to medium. Slowly add the 2 cups of non-dairy milk to the mixture and stir. Pour the almond milk and basil mixture into the blender with the cashews. Blend the mixture. I have a Blend Tec Blender and choose the “sauce” button. You want to blend until the onions are completely blended and the mixture is a sauce. Pour the mixture into a saucepan and simmer at least 15 minutes. The sauce should continue to become creamier. Add lemon zest to taste and additional salt as desired. At serving time, I crumble cashews on top or stir them in for an added crunch. This tasty recipe is from Lynn Bridges. This sauce is very versatile. Use it over all types of pasta and rice, I love this recipe because there is always sauce left over so I get to have it for lunch a few times throughout the week. The recipe makes about 2 cups. I sometimes also add my tasty Sweet Mushroom Topping.